ALBANY, N.Y. – Shereesha Richards trots to center court as she and her University at Albany teammates prepare for the start of a league home game against New Hampshire. Seconds after winning the opening tip, the 6-foot-1 Richards curls in along the baseline, corrals a pass and banks in a shot off the glass. The Great Danes are off and running, and with Richards leading the way, cruise to an 85-48 victory. Richards finished with 26 points while playing just three quarters. Her performance two weeks ago came a day after she was named to the Naismith Trophy Midseason 30 watch list for national player of the year. As her senior season in the America East Conference winds down, Richards is in a place that would have been hard to imagine not so long ago: The native of Rae Town, Jamaica, is on the radar for the WNBA draft in April. “It would mean a lot (to be drafted), just knowing that I could play at this high level,” Richards said. “I’d feel completely overjoyed to have the opportunity. Richards honed her athletic skills playing netball as a youngster in Jamaica. Netball was developed in England in the late 1890s as an offshoot of basketball and is predominantly played by women. Games are more regimented and staged on a rectangular court with raised goal rings at each end but no backboards. Each team attempts to score goals by passing a ball down the court — dribbling is not allowed — and shooting it through a goal ring. Richards hasn’t skipped a beat since switching sports. She became a basketball star in high school after her mother sent her to Atlantic Christian School in Egg Harbor Township, New Jersey. Richards scored 1,147 points in two seasons, averaging a double-double as a junior before enrolling at Albany, where she has rewritten the record books. Her 2,286 points and 1,008 rebounds are school records, and among active Division I players, she ranks fourth in field goals made (883), sixth in free throws made (507), sixth in field goal percentage (58.8) and 10th in steals (263). More importantly, Albany (23-4, 14-1) has gone a combined 102-22 overall and 59-4 in America East play — including a record 38 straight conference wins — since Richards arrived. 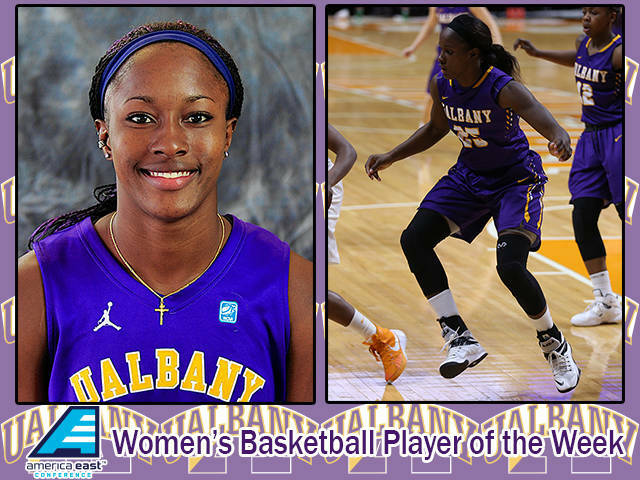 Although Richards has put up dazzling numbers playing in one of the weaker conferences, she has excelled when Albany has played teams in the top echelon of Division I. As a sophomore, she scored 20 points in the first half of a game at No. 2 Duke before the Blue Devils clamped down in the second half, limiting her to just four more. Last season, Richards scored 34 in a road loss to North Carolina, and this year she had 33 in a one-point loss at USC. Richards also has worked hard on her perimeter game — she’s 10 of 35 from beyond the 3-point arc this season after making just 3 of 8 her first three years — and is being projected among the top 20 picks in the WNBA draft. If selected, she would be just the third player from the conference to be drafted. Hartford’s Danielle Hood (2008) and Maine’s Cindy Blodgett (1998) are the others. “When you go to a little bit smaller Division I school, you really have to open up the eyes of as many of the people in the media that mostly think of the top-25 teams,” said Blodgett, who was the sixth overall pick after scoring 3,005 points at Maine and played four seasons as a pro. “In some ways, she’s more ready to be a professional player than some others because of the expectations that she keeps on (producing) on a nightly basis.